is an up and coming Killarney born artist who’s art form is truly unique. 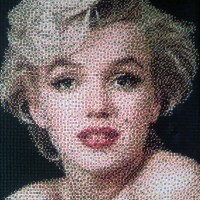 Using tens of thousands of tiny beads to create large works of art portraying some of the world’s most iconic figures, Marilyn Monroe , George Clooney , Angelina Jolie etc. 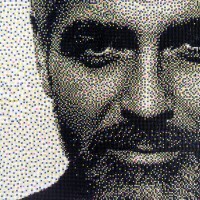 The art form is a fusion of mosaic work and pointilism, using only five basic colours, the primaries, they have a tactile element to them, as each bead can be individually touched., creating a great sense of depth. 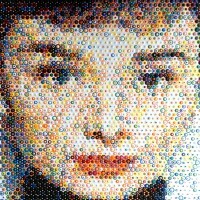 They are painstakingly intricate to complete with the majority of the pictures in this exhibition having in excess of 30,000 hand placed beads When standing up close to one of these images it is not perfectly clear what you are looking at., visible only are thousands upon thousands of coloured beads. As you step back though everything starts to become clearer, until the five colours start to fuse, blend and mix into each other forming colours that aren’t actually there at all. At the optimum distance the illusion is finally complete, a perfectly toned and focused portrait, something very different and more than a bit special.